Not to be confused with Gippsland Lakes Coastal Park. The Lakes National Park is a national park in the East Gippsland region of Victoria, Australia. 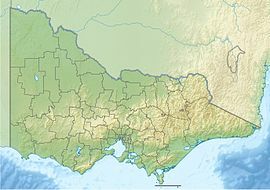 The national park is located approximately 245 km (152 mi) east of the capital city of Melbourne. The 2,390-hectare (5,900-acre) park is set on the east shore of the Gippsland Lakes, fringed by the waters of Lake Victoria and Lake Reeve. The park includes Sperm Whale Head peninsula and Rotamah and Little Rotamah Islands. The park is managed by Parks Victoria jointly with the Gunaikurnai Traditional Owners'. An area of 1,451 hectares (3,590 acres) was initially set aside as a nature reserve in 1927, with the park proclaimed in 1956. Rotamah Island and Little Rotamah Island were added to the park in 1978. ^ a b "Culture and heritage". The Lakes National Park. Parks Victoria. Retrieved 15 January 2014. ^ "The Lakes National Park: Park notes" (PDF). Parks Victoria. Government of Victoria. August 2012. Archived from the original (PDF) on 16 January 2014. Retrieved 15 January 2014. ^ "The Lakes National Park". Bonzle Digital Atlas of Australia. Retrieved 15 January 2014. ^ "Joint management". The Lakes National Park. Parks Victoria. Retrieved 15 January 2014. Wikimedia Commons has media related to The Lakes National Park. The Lakes National Park webpage at Parks Victoria website. This page was last edited on 22 June 2018, at 16:57 (UTC).